Remember Real from the '90s? It's back! RealTimes is an app that lets you create instant slideshows from your photos and videos and store them in the cloud. RealNetworks hasn't given up on a comeback. Twenty years ago, you could hardly stream a song or video on your PC without the RealNetworks (RNWK) media player. Since then, Netflix (NFLX), Spotify and YouTube have left the RealPlayer in the dust. In an attempt to stand out once again, the Seattle-based company unveiled its latest offering on Tuesday: RealTimes. And it's actually pretty cool. RealTimes is an app that instantly creates video slideshows from your photos and backs everything up to the cloud. It's an aggressive bet that people who take a lot of pictures will want to automate the organization and presentation of them -- and pay to back up the files. RealNetworks CEO Rob Glaser says the app is designed for parents who are snap-happy but time-strapped. "We're trying to be the fastest and easiest [video editing] app, not the fanciest," Glaser said. RealTimes is instant because it looks at the photos and videos you have on your computer, phone, or tablet, and groups them into a "story" based on date or location. The app's technology then selects and arranges images based on algorithms. They can recognize faces, identify duplicate pictures, selecting the one that is in focus and more vibrant, and choose video clips based on bit rate, or quality. Depending on how many files you have, a video slideshow can be ready within seconds or minutes. When it's ready, the pictures transition with dissolves, cross-fades, pans and zooms. The app even chooses background music. After you save a story, all of your photos and videos are backed up to a cloud account. You can watch the slideshows on nearly any connected device, and one RealTimes account can be logged into up to 15 devices, so the app can be a helpful collaboration tool. The app has a few drawbacks. Because of the way iOS works, the iPhone app stops stops uploading photos once your phone goes idle. That means iPhone users have to keep the app open to create a full slideshow (that's not true for Android phones). It's not particularly great at making slideshows of huge photo albums -- smaller photo albums worked much better and are decent enough to be shared. Videos can't be edited within the app, but Glaser says a video editor will be introduced in the future. Pricing isn't great either. 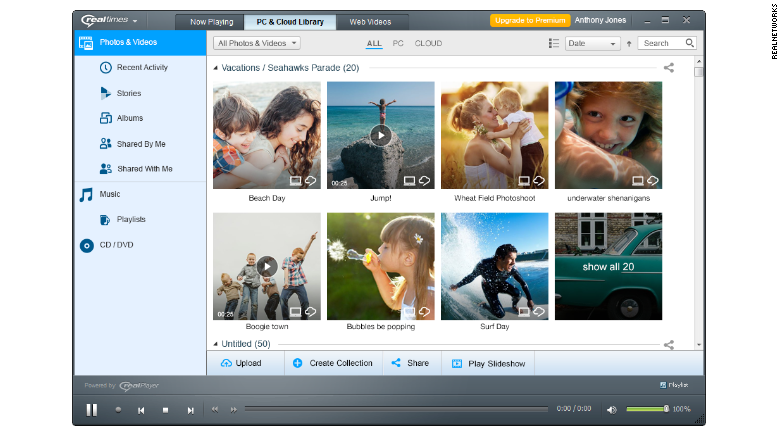 The app is free if all you want is 2 GB of cloud storage, and the ability to create 30-second videos. Longer videos can be created for $0.99 each. If you want an additional 25 GB and the ability to create videos that are as long as you want, it's $4.99 per month (compare that to 100 GB for $1.99 a month on Google). For $9.99 a month, you can get an unlimited storage plan, which is more than what Dropbox and Google offer at the same price (1 terabyte), but that's a lot of photos. Also, Google (GOOGL) currently has this exact same feature in its Google+ Photos app, and Google is expected to give its Photos app a prominent update next week during its I/O developers conference. Everyone loves a comeback story, and RealTimes is a great product. But RealNetworks will need to innovate faster and smarter if it wants to reemerge at the forefront of consumers' minds.